Please add Woody or Disco or Coco on steam prior to applying so you can talk about your application. We use the NI teamspeak during our events and are often in the public VLKA channel when we play. House Name Backstory: In Norse mythology, Odin is killed by Fenrir the wolf. Vlka Fenryka means Wolves of Fenrir. *Must be able to play with ping! * Players must be level 39 Tier 4 plus Tier 3 support class. * Ability and willingness to communicate in English via Teamspeak (mic strongly encouraged) but not needed. team roles and strategies over individual showboating, and willingness to donate crafting mats to our house bank to meet house goals. * 100% commitment to VLKA: No house hopping, you can not be a member of any other house while in VLKA. * This house celebrates success, we encourage teamwork and humour. However, moments of genuine individual and collective awesomeness are often captured by screenshot. There may not be an 'I' in the team but there are plenty of them in 'Individual Brilliance'. If you save the team, jump straight into a breaking shield wall or stare Thor's hammer down as he kills you rather than break formation, it will be noted during your trial. * If you are interested in joining but want some more information get in contact with Woody, Disco, Coco. 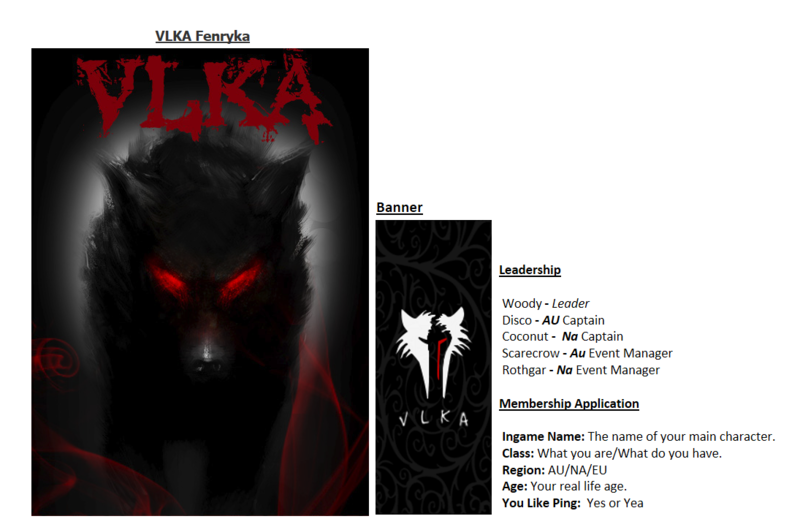 "Denied" = you cannot join VLKA. We don't want you. And now for the best trade offer ever. Am I the only one that is horribly confused? (20-02-2014, 11:34 PM)Handef_Snizel link Wrote: Am I the only one that is horribly confused? Motivational tip: When you wake up in the morning, look in the mirror and say confidently, "That's a nice head you have on your shoulders." Uhm...ok. New Thread here we go! Why the hell is everyone saying good luck ??? (21-02-2014, 03:40 AM)clickeverywhere link Wrote: Why the hell is everyone saying good luck ??? Current time: 19-04-2019, 10:23 PM Powered By MyBB, © 2002-2019 MyBB Group. Design by Aldexy. Edited by Xen.